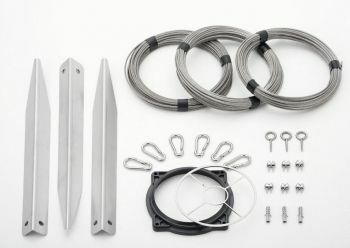 Complete kit including 50m cable, control box and tethering set - ready for simple assembly and operation. Axial propeller technology for ultra high water flow rates and Oxygen enrichment of the pond or lake water. Simple installation and maintenance using bayonet technology. 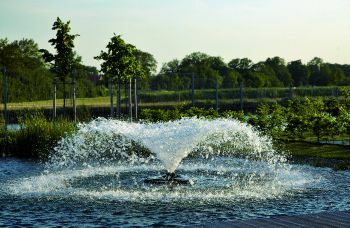 The fountain display can be easily changed to 3 different, voluminous vertical 'Trumpet' water patterns. Due to the floating design, the Air Flo LM can be repositioned into more problematic areas within the pond or lake, if required. Optional Lighting of the fountain display is achievable, with up to 9 lights mounted directly to the float body for stunning evening time illumination. To suit large ponds or lakes from 500m2 up to 15000m2 (Approx 3.7 Acres) per unit. 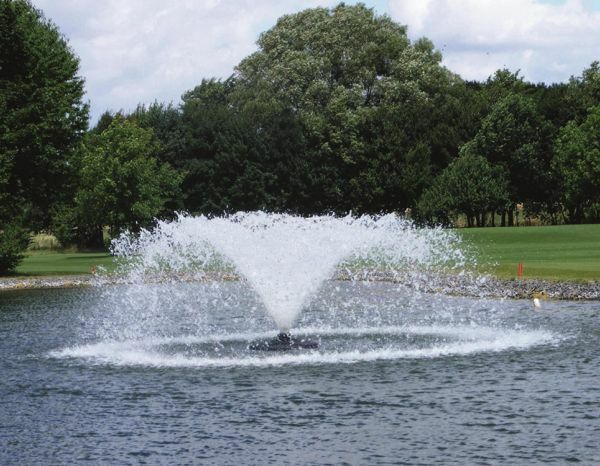 The Air Flo LM is a surface floating Fountain Aerator, designed to introduce oxygen into large bodies of water such as lakes, large ponds and for use in Golf Course water hazards. The OASE Air Flo LM lake aerator is designed with an axial propeller providing unequalled flow rates compared to standard impeller-based aeration technology. Considerable water flow rates are achieved for both the single phase 230v model (Air Flo LM 1500/230v - 165,000 Litres/Hour maximum) and the more powerful 3 phase model (Air Flo LM 4000/400V - 295,000 Litres/Hour). The thrusted water pattern will not only create a decorative fountain display but will also enrich the surrounding lake body with oxygenated water, encouraging the growth of beneficial aerobic bacteria to help tackle algal bloom. Both AirFlo models include 3 fountain nozzles to allow adjustment of the water display sizes and these are simple bayonet connections for ease of installation. Powerful Halogen or LED spotlights can also be fitted to the float assembly if desired, creating highly attractive illumination of the substantial water display. * Axial propeller technology ultra high water flow rates and Oxygen enrichment of the pond or lake water. * Simple installation and maintenance using bayonet technology. * Highly stable float and Stainless Steel pump basket included in scope of purchase. * The floating aerator can be shore or floor anchored (with suitable ballast) using the provided fixing kit and steel cabling. * Due to the floating design, the Air Flo LM can be repositioned into more problematic areas within the pond or lake, if required. * The fountain display can be easily changed to 3 different, voluminous vertical 'Trumpet' water patterns (included in scope of Air Flo LM purchase). 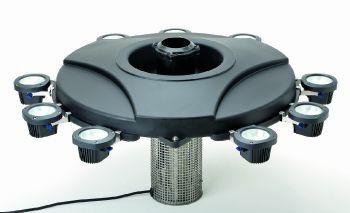 * 2 choices of Aerator Fountain to suit available power requirements and pond/lake size. * LED or Halogen Lighting of the fountain display is achievable, with up to 9 lights mounted directly to the float body for stunning evening time illumination. * 2 Year Guarantee for added peace of mind. * Abundant dissolved Oxygen supply will encourage growth of aerobic bacteria, which consume excess nutrients and organic matter within the water body. * Suction from deeper waters minimises stratification (temperature layering) of the water body, discouraging algae growth in the upper, warmer surface layer. * Mixing of water layers decreases the overall water temperature, enabling the water body to support greater levels of dissolved oxygen. * Suction from deeper areas reduces anoxic (zero oxygen) conditions on the lake floor, allowing aerobic bacteria growth in deeper water conditions to break down organic matter on the lake floor. * Disturbance of water surface inhibits growth of duckweed and other problematic surface plants. * Increase water circulation and surface disturbance will minimise stagnant areas, reducing mosquito and insect breeding cycles. * Improvements in water clarity and overall water quality will encourage fish growth and provide healthier conditions for resident wildlife. * An aerated fountain display provides a highly attractive feature within the lake, with the option for illumination during the evening time. Cross-sectional view of the innovative Air Flo LM Fountain Aerator. This highly stable floating fountain can be repositioned to new areas within the lake or pond, and its low profile allows operation in relatively shallow water depths. The supplied Anchoring Kit & steel cables can be used to shore or floor anchor the floating Aerator. Bayonet technology simplifies adjustment of the nozzle display. Up to 3 optional Lighting Sets (9 Lights total) can be simply connected to the float, for stunning and romantic illumination of the fountain display. 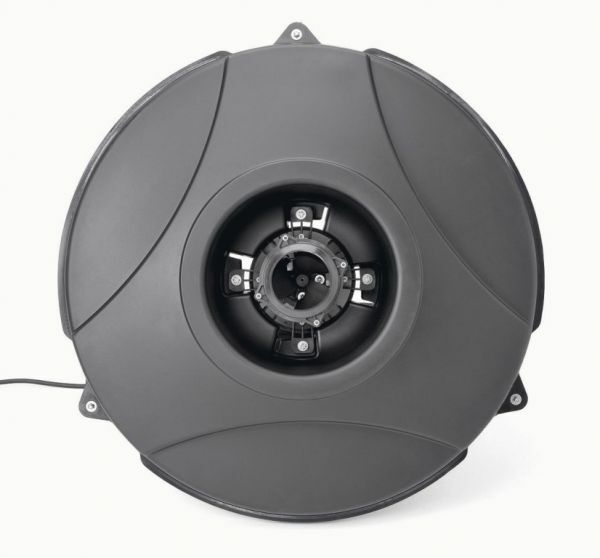 The 400V Version is complete with a ready to connect 5 Pole CEE Connector & Motor Protection Switch. The 230V Air Flo is delivered with control box, ready for connection and operation.